I have previously covered the local launch event in my country and some initial photographs in an earlier thread (http://forums.timezone.com/index.php?t=tree&goto=6509458&rid=0). 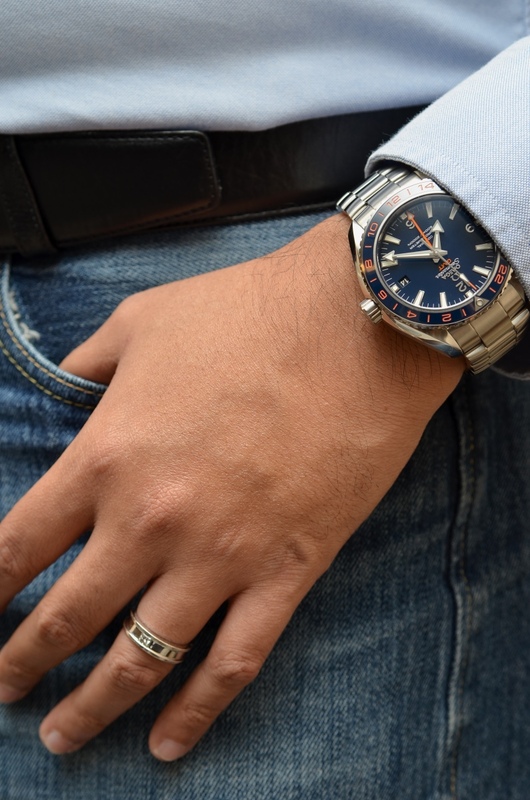 This new post brings you practically all the same watch contents, plus a few new wristshots and owner impression after three weeks of wearing. 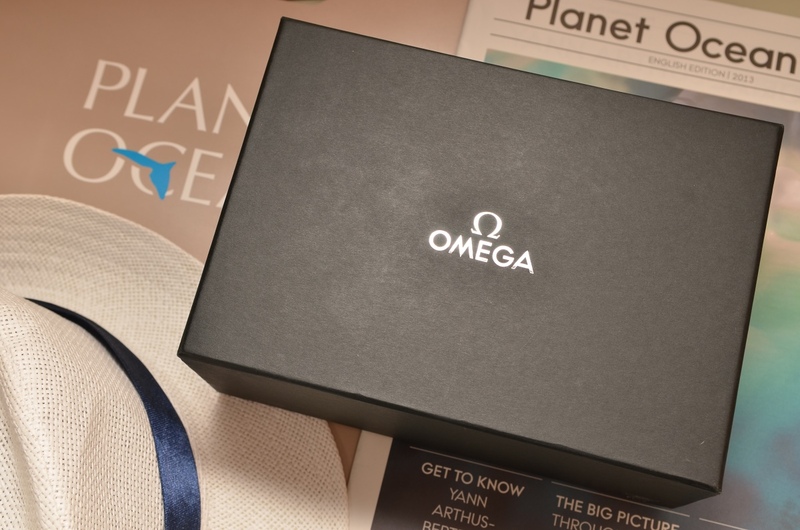 The Planet Ocean GMT GoodPlanet is delivered in a black outer box which looks to be the same size as that of the Ploprof. 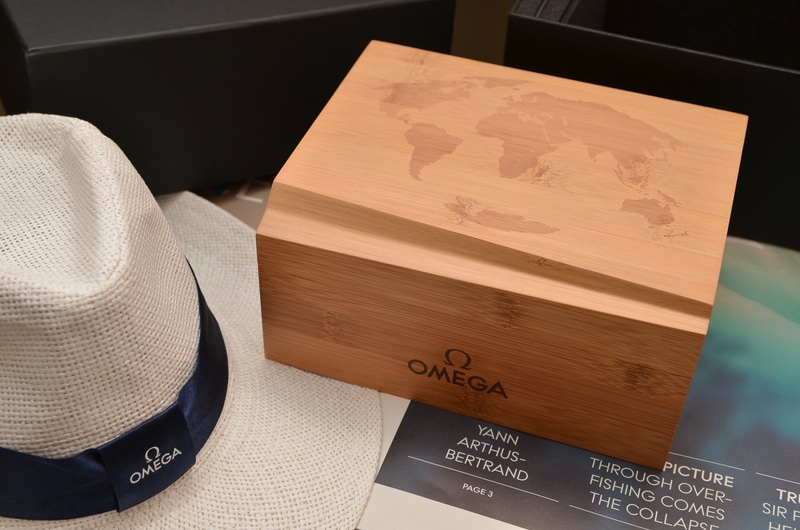 The inner box is wooden, beautifully executed with the map of the world on it. Found under the lid is the name of GoodPlanet Foundation, reminding buyers of the partnership between the two entities. Having worn the Planet Ocean Chronograph 9300 since 2011, I can never get over the feeling that it is too large for my 6.5" wrist. The PO GMT is another story completely. It feels like a good fit to my wrist from the first moment the bracelet was sized. 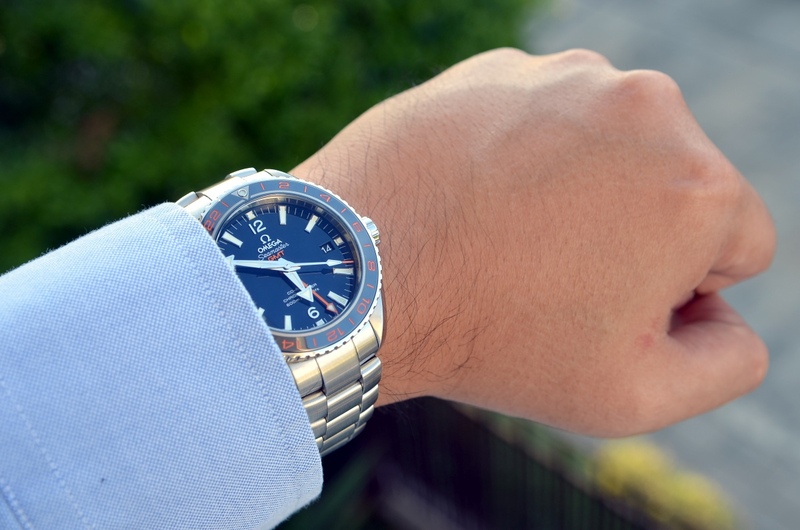 At 43.5 mm, the PO GMT is an ideal compromise for those who feel 42 mm. is too mundane and the 45.5 mm. overwhelming. I measure the lug width of the PO GMT at 21 mm. and the width of the smallest link next to the clasp at 18 mm. 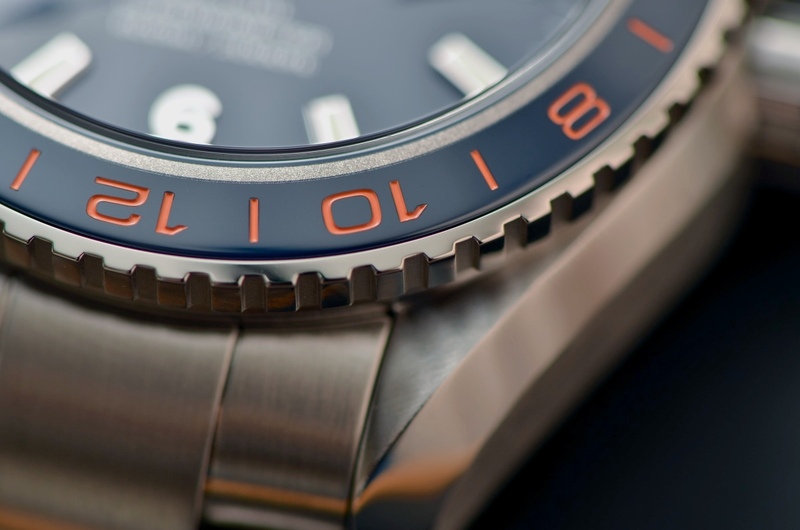 Unlike the GMT hand on regular PO GMT we saw from Baselworld, this one is orange all the way through, not just the tip. I think it is better this way. This orange hand is linked with the minute hand. The regular hour hand, like on Caliber 8500, is indepedent and can be moved forward and backward in one hour clicks, making it ideal for traveling. The date is linked to this regular hour hand. 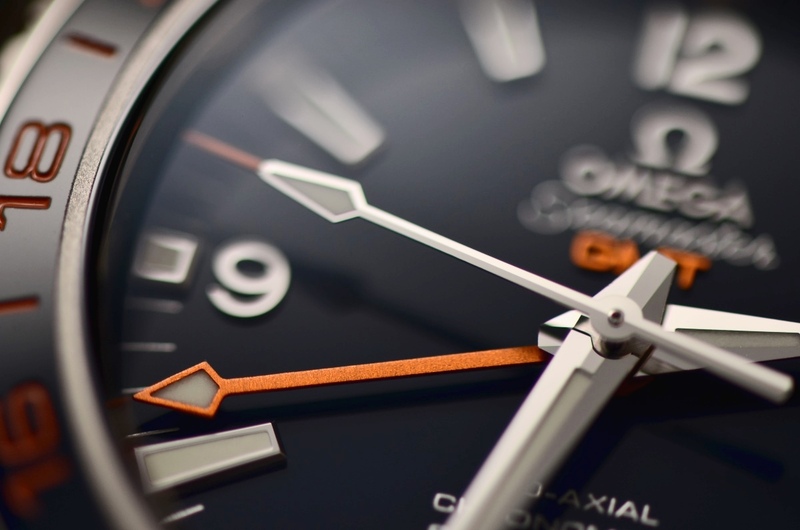 The orange numerals on the blue ceramic bezel are not as strong as they appear in the official promotional shots. In fact, under regular lighting conditions, they do not stand out like the orange traffic cone, so to speak. By the way, there is no "Professional" inscription on the dial. 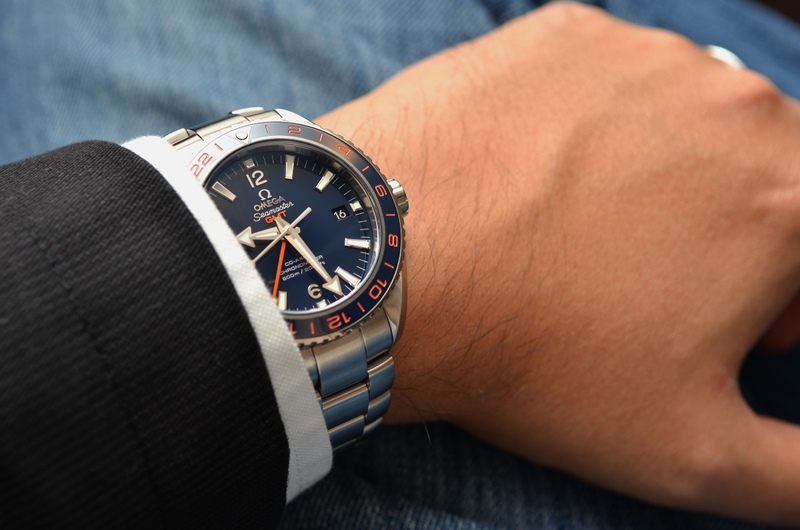 Based on a correspondence I had with Omega over a decade ago, this is because the diving minute scale on the rotating bezel is replaced by the 24-hour scale. I hope the explanation remains valid for this new release. The helium escape valve is retained, however. I personally would not mind if it was removed. That would be logical. In any case, this photograph is supposed to show you the approximate thickness of the watch. I wish I had a PO 8500 to shoot a comparison shot but all I have is a POC 9300. 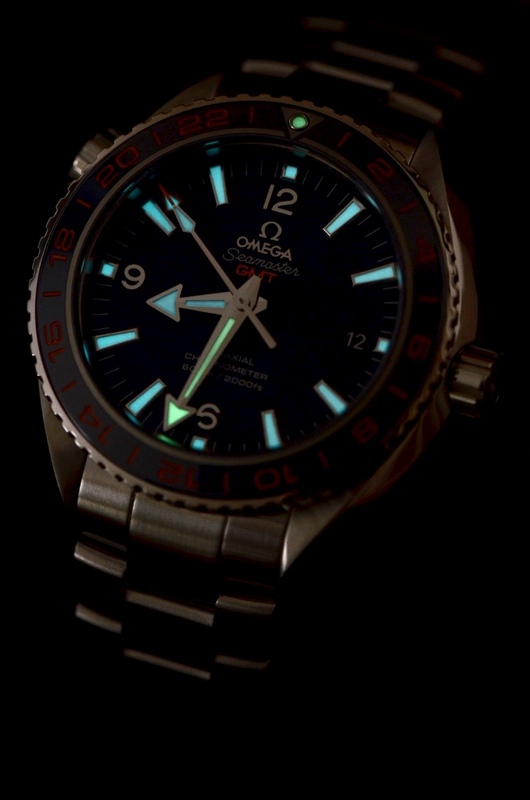 Lume is blue and green like the other PO watches. 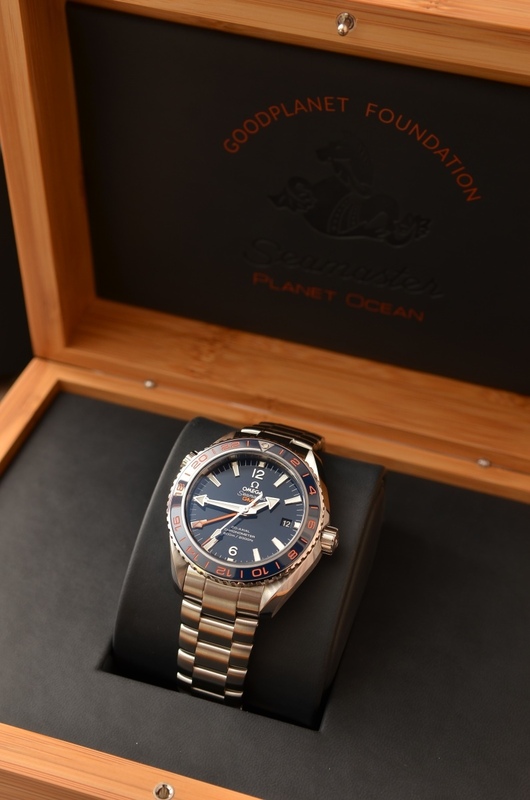 The PO GMT GoodPlanet is not a limited edition watch. There is no engraving of number other than the standard serial number on the lug. Getting the model name straight seems like a small exercise by itself. 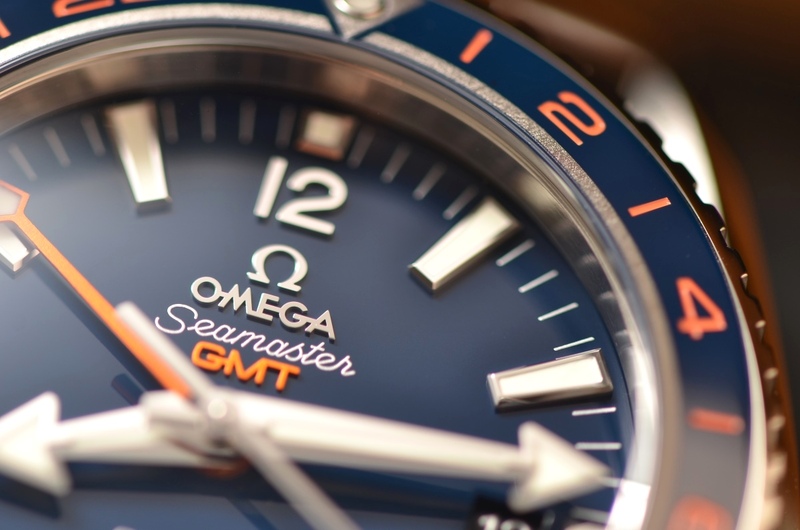 Omega's web site calls it "Seamaster Planet Ocean GoodPlanet GMT" on the product presentation menu. 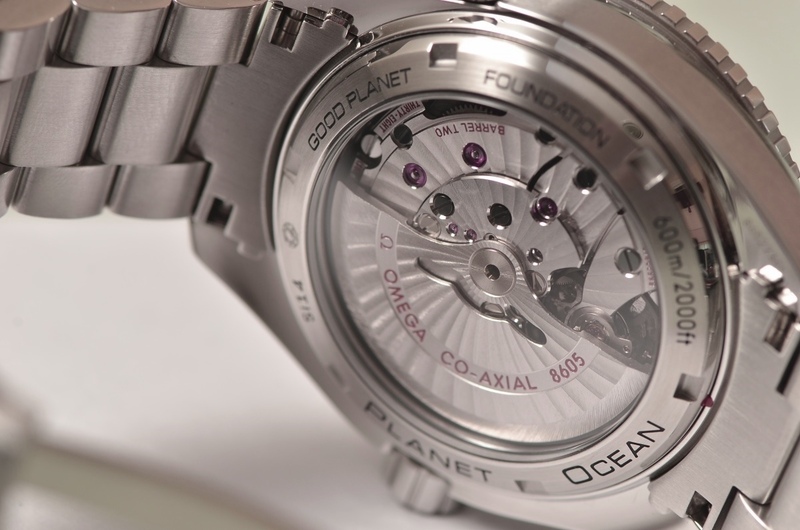 Then when you click into it, the model name becomes "Seamaster Planet Ocean 600M GoodPlanet" without the "GMT" suffix. 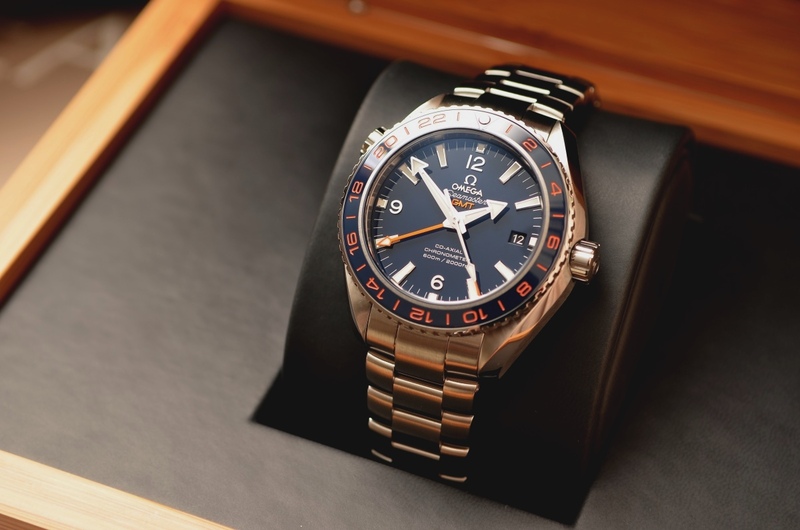 However, when accessing from the Seamaster collection page, the model is referred to simply as "Planet Ocean GMT" and the bezel is incorrectly described as being of the unidirectional type. 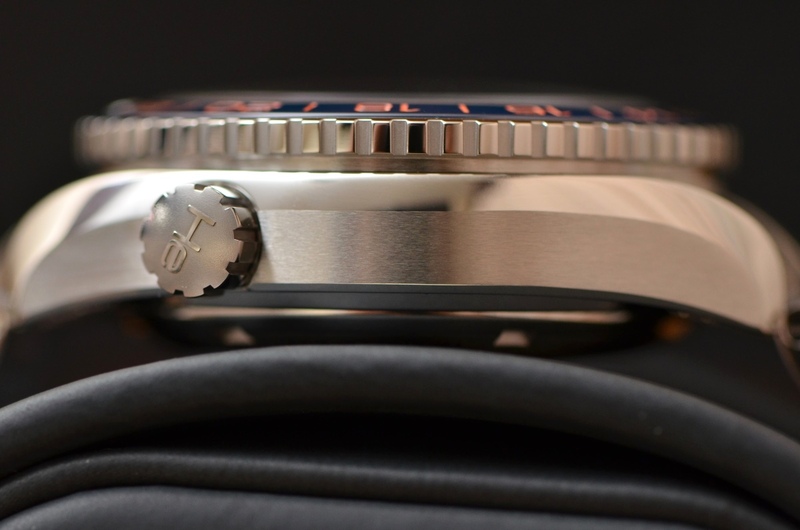 To make the matter more complicated, the inscription on the caseback says "GOOD PLANET" with a space in between the two words while in all other communication and on the foundation's own web site the name is "GoodPlanet" without a space. I am inclined to think that a misunderstanding took place somewhere during the production process. I will not be surprised if the caseback inscription is altered in future production. I will set this confusion aside for now and move on to the more relevant and practical issue of accuracy. I have worn this watch every day for three weeks and leave it in dial up position every night. This specimen of Caliber 8605 delivers an average daily accuracy of +1.5 seconds per day, well within the chronometer criteria and the range we have become accustomed to with the 8500 family of movements. 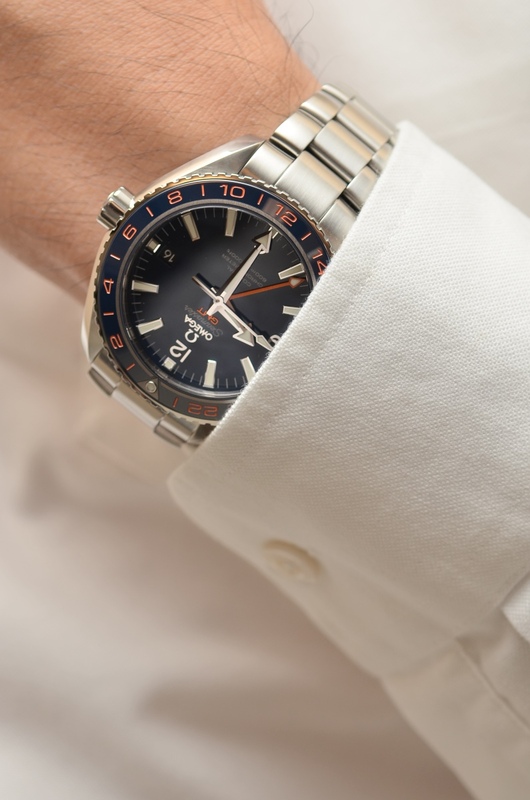 Once on the wrist, the blue hue of the PO GMT GoodPlanet can go from almost black indoor to a lighter blue under very bright sunlight. 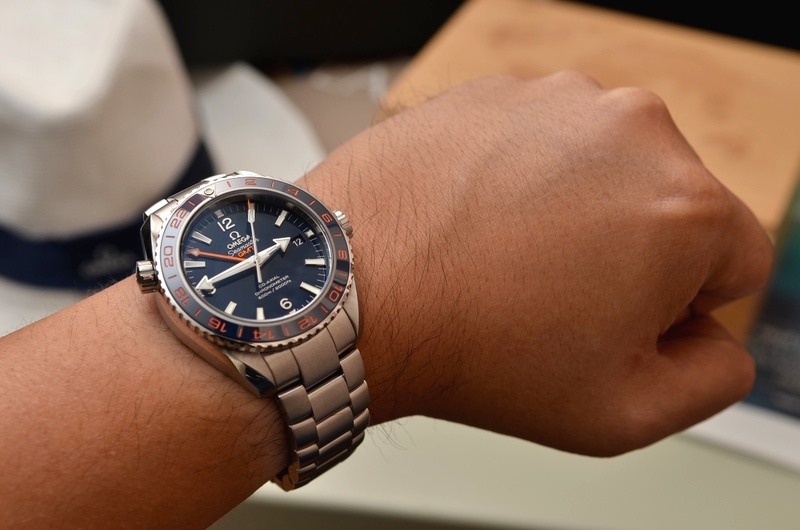 My personal impression is that the whole color variation is more similar to the current Seamaster 300M than the PO in titanium and liquidmetal which has a more grayish kind of blue. 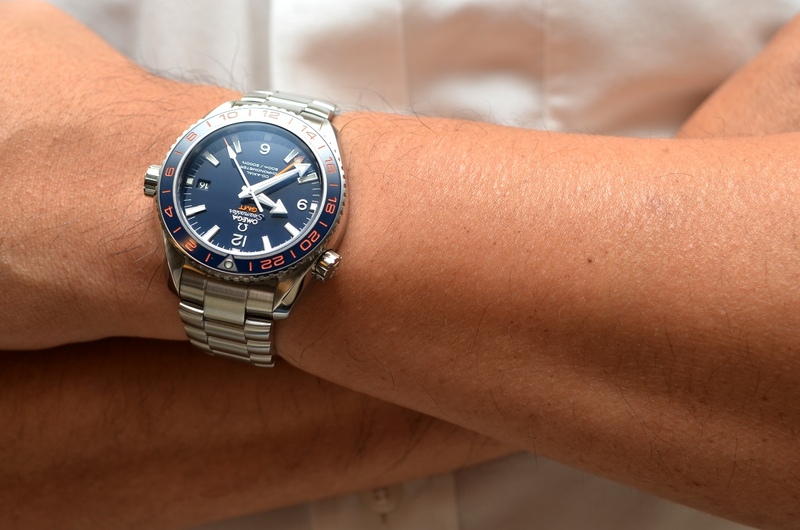 The Planet Ocean GMT is built like a dive watch but with the regular diving scale on the bezel replaced by the 24-hour scale. It does not qualify for dive purposes but should still prove to be a good travel companion. Who does not love a water-resistant, sporty, go anywhere, do anything all-rounder?! Better yet, this is one with the convenience of an indepedently set hour hand. I do not travel a lot across timezones. But for those who do, I can see only advantages here. Previous Topic: 8500 cal / silicon balance spring ? Next Topic: Hey, the new masthead looks great!